He was the greatest guy ever, the man of her dreams and when things got too hard after a life altering accident, Bailey didn’t just walk out on Noah, she ran. Years have passed, Bailey is now a divorced mother of a sweet little girl and her widowed father has just announced he wants to remarry. Little did Bailey know, and her father certainly didn’t, but the woman he wanted to marry was Noah’s mother and now they would all be spending a week together in a secluded cabin and Bailey would have to revisit her ghosts, her mistakes and the aftermath of what her leaving did to Noah. Wasn’t it bad enough that she ran from the only man she truly loved into a marriage with a man-child who never understood the concept of growing up? Noah has come a long way since the accident, now a successful doctor, still handsome, still charming, at least to everyone else. To Bailey, he seethes with anger, hurt and betrayal and it’s had a decade to fester, but this isn’t about them, it’s about their parents, right? Can these two keep their issues at bay for a week? Can Bailey keep her foot out of her mouth that long? And really, did Noah have to be the Dad her daughter never knew? 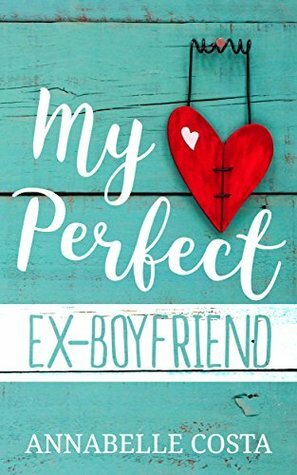 Annabelle Costa’s MY PERFECT EX-BOYFRIEND is about facing the past, finding/giving closure and moving forward on the path that was meant to be. Lots of humorous, if not sometimes painful moments, a sparkling ray of sunshine in a little girl, trips down memory lane and finally, heart to heart communication. We live this story through the chaotic jumble that is Bailey’s mind and I need to be perfectly honest, it took awhile for me to actually warm up to the mess that is Bailey. Sure, she was tossed into the lion’s den unarmed, but was it a form of Karma or did Fate have its own plan? Now, Noah was a different story! He got his jabs in, and to be honest, he could have been so much worse! The real Noah was warm, strong and has come through what life has dealt him like a Romance Hero. No one said love or even “adulting” was easy, but Annabelle Costa’s writing is spot on as she squeezes our hearts just enough to wish for a happy ever after for everyone! I received a complimentary copy from Annabelle Costa!